Question: Do men have bigger Egos? That is a great question because on first interpretation or first glance I kind of agree that males seem to exhibit more ego like traits; of course we are basing this assumption on western culture. 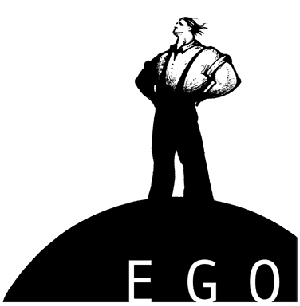 First, I think we need to define the ego and label it for what it really is – your FALSE-SELF. Sounds negative doesn’t it? The thing is; we need our egos to socially evolve. Imagine isolating a child from any social existence – That child would not grow an ego, but this child would also not grow up to be a high functioning cog of society; no, this child would be more like an animal. As children and young adults we need the ego to compete and forage for subsistent strategies as outlined in Maslow’s Hierarchy of Needs. After food, shelter and love, we yearn for something more: Self-Actualization! It is then when we need to begin letting go of the ego and connecting to our True Nature. Only then can we evolve to the next level and prosper though self-discovery and enlightenment. The point is, both males and females need the ego to socially evolve – the gauge tends to be which gender or individual carries ego traits into adulthood. So, the ego is our false-self. It seems all of us unknowingly carry the ego through daily life – it tends to rear its ugly head during times of conflict, challenges and pressure. Men tend to add a testosterone driven quality to it that seems to emblazon the concept of ego. Still, the ego is not always about brawn, bar fights and peeling out at green lights. The ego defines and manipulates our self-esteem, jealousy, anger, guilt and addictions – and these qualities effect both genders equally. So, it seems both genders tend to harbor these traits and at different levels. Look at the Dalai Lama – he is one of the most egoless humans on Earth and he is male. Look at some infamous female rock stars and their excessive demands while on tour. Each of us is different in how we unknowingly allow the ego to govern our existence. Women might find their ego more entrenched in relationships, friends and what they see in the mirror. Men may find their ego through competition, money and how they measure up to other men around them – really both genders will overlap all of these qualities and many more. In a nutshell, both females and males exhibit ego like qualities – just in different ways. The key is acknowledging the ego and slowly working to take power away from its facilities and give that power back to your authentic self – your true-self. « Fear is your biggest Enemy – Face it and Evolve!